An alternative platform to Disqus, with the addition of Markdown. I wonder where it sits with webmentions and microformats? Right now, we’re looking for a team of adult volunteer commenters. Can you help? I would love to help, but can not guarantee the time. I wonder if there is a means of finding a random post, such as the ‘?s=random’ function with WordPress? 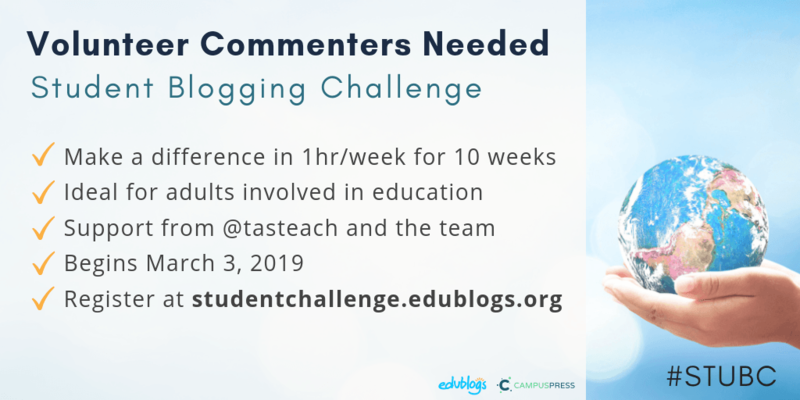 February 6, 2019 Kind ReplyTags Blogging, Commenting, EdublogsLeave a response on 💬 Could You Volunteer as a Student Blogging Challenge Commenter? One of the questions that I often field during my workshop on blogging is, "how do you keep track of what students are writing?" The answer to that depends on a few things including how frequently your students are publishing and the platform through which your students are blogging. This is one of the big challenges with student blogging. When I used Edublogs in the classroom, I would moderate everything, therefore I would know what is being posted that way. However, I have been wondering lately about the idea of creating a formula in Google Sheets using IMPORTFEED where each new entry to that feed is added to an archive list. Then you could add a simple checkbox to tick off if you have responded to the blog in any way and even condition the whole row to make this process a little more visual. Another metaphor I often reach for is a DVD. Much of what we do in school feels like the movie on the disk- the paper, the project, the presentation, we focus on the final end product. But my favorite part of DVDs was always all the other stuff, the extras– the director’s commentary, the out takes, the location mini documentary, the story of the making of the movie. I see blogging as providing that too. Ask them to write Extras. I love the notion of the ‘extras’ Alan. I think that I probably need to do more of this. In regards to comments, I always wonder if we restrict what we consider as a response. I think that being constructive is useful. I just wonder if the ability to comment on Twitter or Micro.blog extends this? We’ve got to stop telling people who are new to social spaces about the “power of audience” because the truth is that most of today’s audiences are muted at best, choosing consumption over participation in nine conversations out of ten. Start commenting on the work of others. Start responding to people’s posts in Twitter. Let people know that you are listening and learning from them. Show gratitude for the time that they put into thinking and sharing transparently with others. Provide challenge to their core ideas — and then push those ideas out through your networks. I want you to think about my buddy Bob for a minute. He took his own time to read my original bit on audience. Then, he took even more of his own time to craft a reply that challenged my thinking and articulated concepts that I hadn’t considered. Instead of spending that same time on his own growth, he was making an investment in me and in our intellectual relationship. That matters, y’all — and I need to respect that investment in some way. Ferriter has been writing a lot recently about reflection, audiences and comments. Personally, I have taken to being more intentional with my comments by sending comments from my own site. This has had its hiccups, but I think that it offers an alternative future and positive possibility.